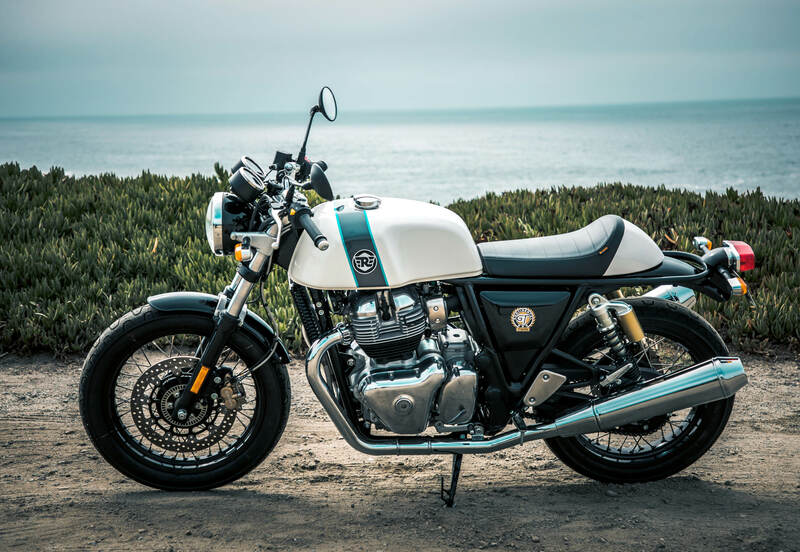 If you want a retro-styled 650 on a tight budget, you might want to wait until early next year when Royal Enfield offers the Continental GT 650 and the INT 650 in the United States at remarkably affordable prices. Starting at $5,799 (for the INT 650) and $5,999 (Continental GT), RE will dramatically undercut the pricing of competitive models. The 648cc air-oil cooled parallel twins are rated by the manufacturer at 47 horsepower and include a 6-speed transmission. The bikes are relatively light at 435 pounds (Continental GT) and 444 pounds (INT 650). This is a good looking, modern, cheap, nice bike and built for fun for people who have money for fun. Some very smart people in England and India added their many nice touches to a solid bike. I do admit RE has a problem selling when the nearest dealer to me in “high net worth Boston” is in another state. Two in Connecticut and none in Rhode Island, Massachusetts, Maine, NH or Vermont. Will a youngster choose this over a Ninja 400? Dunno. But not anywhere near Boston. They need more dealers in USA which is a small market to start with. It does not compete with Honda CB1100. Maybe RE will try that but that is a long way out. A kick start and a carburator would have been fun. Carbs are as useful and desirable as the proverbial teets on a billy goat. That 650 Continental got me thinking. Could not Honda have slipped an Africa Twin 1 Litre engine into a frame of an existing range and dressed it up like an CB1100EX ? Only 1 bike used for that motor – not so like Honda seeing how many variants that have spun around their 500cc twin. Not too hard to do, and make it look like the Royal Enfield Classic British Twin. A Honda Triumph Bonneville anyone? I often think that when I ride my Africa Twin – how awesome that engine would be in a roadster. I figured that they were waiting for sales to slow down on the AT first but it really feels inevitable. The chrome tank Interceptor (sorry, Int650) will definitely go in my garage. I like the looks, the price and the reviews. Whether or not it was worth the 48 year wait is another story. It will also most certainly be my last bike and I’m glad to see it finally made it into production. The spin-on oil filter, oil cooler, 6 speed gearbox and the fact that it can hold its own at highway speeds have me sold. They are attractive bikes. Honestly, though, I’d have a hard time paying $6000 for one based on what I’ve seen from REs in the past. Hopefully riding and seeing these new 650s in person will change my mind. I’m impressed so far. Save judgement for the test on it. I was expecting a higher price also. Cheaper than my W650 in 2000. Hope it’s a good one. Seems like a good number of posts in a short period, which I presume correlates to interest. Kawasaki did just that with the W650 and the American market showed very little interest. Their timing sucked. Though how man of the sr400s are yamaha selling? I bought a new W650 because I got tired of waiting on Triumph’s air cooled twin. America showed little interest because it was a $6,000 bike in 2000. That’s almost $9,000 in today’s money. The price of the Royal Enfield will get the attention of a lot more people than the W650 did. What’s alarming is the inflation rate of almost 50% since 2000! I believe that’s only about 2.25% per year. Nothing out of the ordinary when averaged out. Yes. Which explains the interest in, appreciation of, and government disdain for bit coin and block chain. Get this: for the last few years of alleged boom times, each $0.42 of GDP growth cost $1.00 in debt. That is net 58% negative growth in alleged boom times. If you think that’s sustainable and a net gain, you flunked HS math. If you don’t promote, you don’t sell very many. Triumph and BSA had a similar issues when the had an abortive development with the Triumph Bandit and BSA Fury , both 350cc and 36HP and light weight, 10,000rpm redline . They had the very real potential to take away sales of the big twins. So they never even saw production. It is more likely that they just couldn’t hit their targets. Maybe the engine didn’t perform as well as they said, maybe they weren’t going to be able to sell it for little enough. I doubt it was a concern for cannibalizing their bigger bikes. With the exception of multi-bike owners (a very small subset), big bike riders and small bike riders rarely cross-shop. Years ago my dad was complaining that they weren’t building any classically styled simple bikes any more. I told him about the W650 that was sold around ten years ago at the time. He said he never knew about it and why would he? He does not walk into motorcycle dealers any more and Kawasaki never advertised the bike in anything other than a sport bike magazine. How did they ever expect to sell the W650 to guys like my dad when they never bothered telling him? I think the main problem is the cost of telling your dad. Perhaps these days it may be a little cheaper and easier to target advertising through YouTube, Facebook, etc. But what would one have done back in 2000? There were print mags, radio, and TV for the most part reaching his generation. TV was too expensive for a small market bike like a W650. Radio was very expensive as well considering the number of geographic markets they would have needed to hit. That just left the motorcycle publications. The Japanese designed and built CB1100 is a simple air cooled 4 cyl, 6 speed, chain drive, dual discs front, single disc rear, some have ABS (mine does) with classic looks and 88 horse power and 65 lb ft of torque starting at about 2000 rpm. I average 57 miles per gallon. I’ve put 43,000 miles on mine and one guy on the CB forum has put over 100,000 on his. Pretty much stone reliable. Yes, it costs more than this retail, but it has quality fit and finish and Honda reliability and a huge dealer network. Left over 2014 models can be had in the $6995 range, sometimes less. I’m reading about big discounts on The Kawasaki RS models too. If you want Japanese, you can get one for not much more than these Royal Enfields. That said it looks like a nice bike and if a dealer is anywhere near by would be worth checking out. The CB1100 weighed well over 500 pounds. No matter how many times somebody says “the weight disappears above x mph”…it doesn’t. The difference between a lightweight (relatively speaking – full up I’ll bet the real world weight of the RE 650 is going to be close to 450 lbs which is still a bit porky) simple twin and a bike as large and heavy as the CB1100 is not insubstantial. It isn’t about design as much as it is about purpose/functionality. As good as the CB and the RS are – and they are very good motorcycles – aside from classic design language they just aren’t the same kind of simple, purposeful motorcycle as the new RE 650s appears to be. We’ll see after some objective information comes out. My wife and I have matching CB1100’s. Their weight is low in the frame and combined with a low seat height, does not feel heavy even at a stop. One of the easiest, most pleasant bikes to ride I’ve owned in 50 years. I like these new RE’s and might to ad one to the garage. Amen! I’m 6-3, used to leg press over 1k lbs. Sat on a CB1100 on the showroom floor, pushed it L/R between my legs, and thought it felt heavier than desired, especially the fuel sloshing around. My ’00 R1150GS is heavier but felt lighter when parked. IIRC my ’79 CB750 SS felt lighter, though not sure the weight difference. Compared to the current CB1100 I prefer the looks of ’79 through early 80s CB750 Super Sports (and CB700S). IMO the following describes an interesting CB1100 styling error: the current CB1100 comprises SOHC body cues with DOHC motor, which never existed in earlier 750s through 1100s. I have the opportunity to spend a week around the new 650’s, inspect them in great detail, talk with the engineers and ride them. The engineers are mostly from Triumph and they learned a lot form the Bonneville and 675 engine programs. One engineer disctribed that they performed 250 hours of modulating between full throttle and full torque. They claimed the 675 was tested to 27 hours for comparison. Should be promising for reliability and over build for enlarging and turning. The frame is designed by Harris, which Enfield has interest (owns or partners). I was able to scale both bikes and the heavier was the Intercepter650 with the center stand at 455lbs with gas. Quite a bit lighter then my first year 2001 Bonneville. Was for the ride, it was surprisingly modern. At low rpms felt similar to a Suzuki GS500. Super smooth, quiet, seemless fueling and no judders even down to 2000rpms. Once over 4000rpms, much more character and growl from the stock exhaust both on and off throttle. Good power to hit freeway speeds and spirited back roads. I would again compare to my 765 Bonneville but I’d give the sound and character to the RE650. With the balance shaft was surprisingly smooth all the way through the rev range with is 7500-8000rpms. There were a couple models filled with race baffled S&S silencers. Sounded much more impressive, like a 650-750 90degree twin. I hope and assume they have a 750 drop on big bore kit or upside later models in the coming years. Clutch pull super light and with slipper clutch. Bosch injection and ABS. The former excellent, the later functional. Handling is light but reasonable stable at highway speeds. Nimblein the tighter backroads. I’m quite impressed with this new RE 650 lineup and think will be an excellent entry level bike, especially for the money. It’s miles better then their older singles! If you have(had)a 2001 Bonneville it would be 790cc. From 2007 on they were 865cc until the lc models came out. The BSA’s will be nice but I think they are going more high end on price. 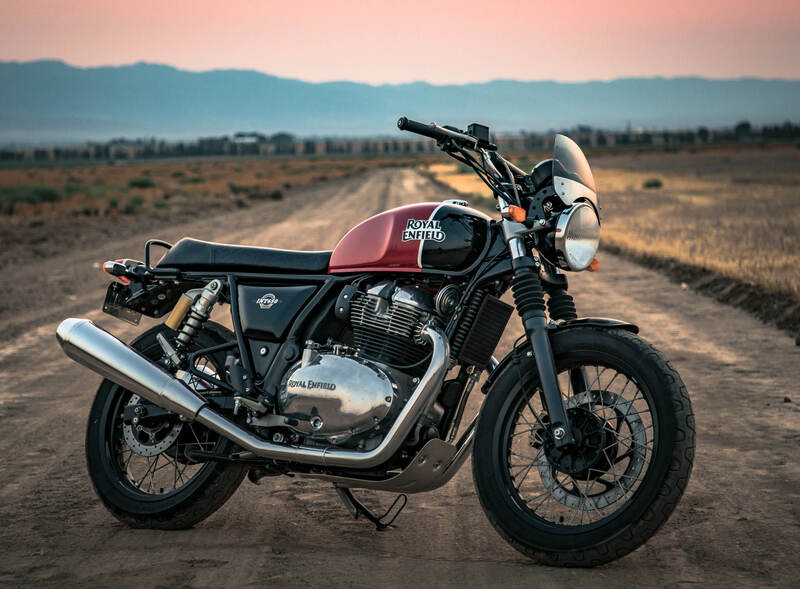 Basically a Brit designed bike made in India; another Boneville. But still, not bad to have some selection and lower price. Except that the Bonneville is built in Thailand. There will be a big bore kits available with cams and exhaust. They should sell the heck out of those. Balance shaft or shafts? Without them they will ride like a paint shaker, ala early British vertical twins. Love the look, weight and ergos. 270 degree crank and balance shaft so it should be a smoothy. Royal Enfield should be sued by Triumph for this obvious copycat design. Seriously? If all the manufacturers who ever built overhead cam, air cooled parallel twins sued each other there wouldn’t be enough lawyers. I own a 2008 Bonneville, an XS650 Yamaha, and previously owned a Kawasaki W650 and aside from the basic engine architecture I see very little similarity. Not to mention Kawasaki KZ 750, Yamaha TX 650, Suzukis 650 Parallel twin (forgot the nomenclature) which was actually a pretty nice bike. Ahh I remembered Suzuki GR 650. There was a TX650 and TX750, so you’re right either way, but how could any discussion about parallel twins not bear mention of the ever popular Horex? lol! For what reintroducing their own twin from the sixties. Actually, those twins from the 60’s were made by Enfield, of Britain. The company making these new bikes is Royal Enfield of India. The Indians added the word Royal to their Enfield Bullets in 1999. Ignore what I wrote above, I am misinformed ( in other words, wrong ), but I can’t delete it. Regardless of the company name’s history, this is a clean-sheet, new engine, not a re-introduction of their engine from the sixties. And you think anyone at Triumph is so stupid, exactly why? If one squints their eyes, it has a bit of the old Norton massiveness of the engine as well as the overall look of a 60s motorcycle with Dunstall pipes, however no dealerships – no sales. A warranty means nothing if unreliable. We will see but not with my money. I saw a likeness with the engine case of a Jawa CZ. I’d guess that a scrambler version is pretty much a lock, even if it’s a parts kit like they had for the singles. A 650 Himalayan is possible – the motor doesn’t look that much bigger than the 400 single. And I’ll be willing to bet that fuller fenders are in the accessories catalog. At least I hope so, the shorty fenders aren’t that attractive. I doubt it’s an “easy” change to tubeless so I will pass. They should’ve made them tubeless from the start as I refuse to have to upgrade a safety related item because paying homage to the past doesn’t mean it shouldn’t be up to snuff on something as critical as wheels and tires. Otherwise, great looking bikes and I wish them luck! Either would show well alongside my BSA Lightning and Rocket III. Better yet, it will probaby start everyday. I’m wondering why the GT has passenger pegs. Who wants to ride 2 up on that seat? The two-up seat is stock, the cafe style is the accessory item. Why is there a skid plate under the INT 650? If you zoom in, there appears to be an oil filter front and center between the cylinders. As the fender is a short one, it’s probably to protect that filter. It is not a skid plate. It is a drip pan. Thought I saw my Street Twin at first glance, down to the vertical strip on tank. What is the firing order of this engine 180, 270 or 360? Beautiful! Add another motorcycle to the gigantic selection available today for riders! should sell a lot of motorcycles here with these new models. And a 3 year warranty! ?! Why put a Triumph tank on i?. I’d rather it came with an old Atlas or Ranger tank. I rode the old Continental GT…pretty slow so I think the 650 twin should be a fun bike at a very attractive price …..I can’t see why the reliability won’t be on par with other manufacturers ..modern bikes are way too advanced in both power & electronic rider aids. R.E should be able to attract newer riders with this more simple approach….remember it’s more fun & safer to ride a slow bike fast than a fast bike slow! Modern bikes are extremely reliable, have long maintenance intervals, have different levels of electronics (this has more than some), and come in all sizes. What is “way too advanced”? Well, if you rode the old Continental, that means you were close enough to it to give it a good lookover. Having ridden and seen up close the Royal Enfield attention to detail and quality, my opinion is quite the opposite: I could not possibly see how those bikes could be as reliable and durable as competing bikes. These 650’s may signal a new era for RE, but I’ll need to see it first before I believe it. Motorcycles were fun in late sixties. Not that I was old enough to ride back then. They didn’t need 200 hp, 13″ suspensions, electric starters or GPS. They were real men riding real motorcycles who knew how to have fun. I have just one question. How good will I look in my yoga pants riding this thing? Not a shot at hipsters. These bikes look to good to let any group claim them. Besides they get bored move on with things fast. On A less serious note will Yamaha tell me why an XT 250 cost more? The 2019 Yamaha XT 250 lists at $5200usd, the Enfield’s start at $5800usd. So the XT 250 does not cost more. I know mine is worth every penny I paid for it, it is well built and reliable. Hopefully the Enfield will be somewhere close to that. Ok, why only 600 more? I don’t know about labor cost or if the xt is built in Japan. The story is about RE so I kept it there. I just can’t figure out why it would cost as much as say an m3. Entry level bikes should have entry level prices. Mostly, motorcycles were fun in the late 60’s because I was 50 years younger. Obviously the retro craze is the current hot ticket in new motorcycle sales. Ducati and Triumph are doing well in this market, but they are $10-12K and come with a 24 month warranty. The RE twin is about 1/2 that and will offer a 3 year warranty which would indicate their confidence in the new engine. As far as the retro look, these new models have it in spades. At that price, I could make room in my garage next to my 73′ Triumph and KZ750B. I sure like the price and the look of both models. But…..I have to wonder about reliability and I sure wish it had a 360 degree crank. For me it would be a fun play bike with an occasional jaunt on a country road. I like it and the pricing is aggressive. Should be a winner. I would love to see these be competitive in the marketplace, but against who? The CB1100 has it beat on all sides. The Duc Scrambler same. Triumph has the retro britbike style market cornered. At the displacement and price point they will be in their own class, which is probably a good idea, I really like the Triumphs but gawd are they heavy and they are loathe to come off of the $$ they are asking for them. 47hp is better than an 883 Sportster which is more than enough to cross the country or blast a backroad on, if these prove to be reliable, they’d be worth checking out. None of them sell for within $2k of what the RE does. The CB1100 costs double. If these are successful, they will effectively be alone in their own market. I would not mind having either one or the other. At $5k, why not? Nice effort on the period styling without being slavish to style over function. Take the rear shocks for an example: Two in number, rather upright mounting position, yet nitrogen charged. It would be good to see the INT model with full chrome or stainless fenders and chrome wheels. It’s crazy how this stubby tail section garbage is so mandatory now that even the Continental GT has the tail section end on a seemingly random location on the rear fender. At least it has a rear fender. I wonder if it has ABS or if it just has ABS ready wheels. Have you ever seen trains in India, with hundreds of people riding on the ROOF of the cars? Or moving traffic on any of their busy highways? I suspect that ABS brakes are an afterthought’s afterthought there. may be you have visited Bangladesh n not India. Last year ABS became mandatory on motorcycles sold in India. The ones shipped to Europe have to have ABS by current regs and the specs on the website says they come with Bosch Dual channel ABS. Checking the official USA Royal Enfield site, they mention ABS for both models – Bosch dual-channel units. Four valve per cylinder SOHC. There’s a good picture of the head on their website. Nice looking engine that should be easy to tune for more power. I would like to see a Scrambler version. They are light enough and the motors are supposed to be torquey. So, would make a good back road bike. Great price. How reliable are these Royal Triumphs? For reports on RE’s relability, perform a google search. There are a lot of damning reports on the RE Himalayan from Indian consumers. I havent read anything uncomplimentary on these twins …. yet. I’d be interested in buying one just for inner city riding. I’ll still to my Hammer S for country trips. Aw man, you’re wrecking the dreams of so many posters here that are falling in love with the idea of paying 1980 prices for a beautiful British twin. They want their cake and eat it too, can’t you see? They’re expecting a reliable, good looking and reasonably performing bike for less than $6,000. If you bring a dose of reality into it you’re going to have a lot of long faces and broken dreams. Once they read the RE forums and see what the owners really think of the the RE they’ll realize that all the features they expect in a new 650cc twin built in India aren’t attainable. So try to keep it to yourself, Mr. Dream Wrecker! I think the first generation Himalayans had some problems, not so much in the ones made now. I dont own one, but have spoken to 2 owners who have put good miles on them and they happy with the bike, reliability, and what it can do. A chap I’m freinds with on Facebook, Nathan Millward, has ridden his Himalayan 10,000+ miles this year including across the USA, Land End to John O Groats, and round Eire, and he seems pretty happy with it. If I wasn’t such a confirmed Guzzi nut, and poor-ish, I’d be looking at one as a second bike.